I get a lot of e-mail. If you are a student currently enrolled in a class that I teach, or a Biophysics major advisee, put that in the subject line. I want to reply, but if I don't — please come see me. If you wish me to review a grant proposal, article for publication, or promotion case, please don't assume that your e-mail has been read or even seen. It may be necessary to get me on the phone if you need me to do those things. (with Jesse M. Kinder) (Princeton Univ. Press, 2018). You can get it directly from Princeton. E-book editions are available from Amazon and other distributors. The book has an associated blog. Chapter 1 is freely available. A Chinese-language translation of the first edition is available, and also a Korean-language edition. (Princeton Univ. Press, 2017). The hard copy edition is available from Princeton. There is an e-book edition, available for Kindle or via Google Play. Chapter 1 is freely available. Three additional chapters are freely available in preliminary form. (WH Freeman and Co, 2015), now available as an e-book via Google Play, Kindle, and CourseSmart. If you are looking for a hard copy, you may find a good deal from an Amazon affiliate, or here. Available in Chinese translation: 生命系统的物理建模 at these three links. 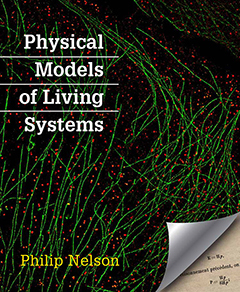 “[T]his excellent book will appeal to both students and professional scientists in the field of quantitative biology… [T]he book feels personal in its selection of topics and the training journey on which it takes its readership. 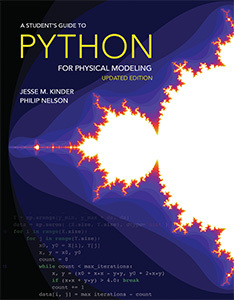 In our opinion, the combination of this uniqueness with technical accuracy makes the book a noteworthy and valuable addition to resources for advanced biophysics education... [T]he book conveys rich information, is clearly structured, and provides comprehensive data sets... Nelson shows how computational programming can be used effectively in modeling biological systems at the cellular and molecular levels.” -- Dietlind L. Gerloff and Jonghoon Kang. Cell Biology Education (2016) vol. 15 (4) pp. fe11-fe11. Most of these articles are freely available at Penn's Scholarly Commons. Here are my profiles in ResearcherID, ORCID, Scopus, and Google Scholar. The research in these publications was funded in part by The National Science Foundation and by the Human Frontier Science Program. "Any opinions, findings, confusions, contusions, contortions, and conclusions or recommendations expressed in this material are those of the author(s) and do not necessarily reflect the views of the National Science Foundation." Note: PDF reprints are provided below within the context of fair use. Please obtain copies from the publisher if appropriate. How can cellular recognition processes be so accurate? Stochastic Simulation Exercises for Visualization of Gene-Expression Dynamics and Error Correction in Biological Cells. With Chen and Zuckerman. Available on BiorXiv. How can a system behave in a way that is strongly classical yet also strongly quantum? The Role of Quantum Decoherence in FRET. Biophys. J. 115 167--172 (2018). Does the quantum character of light matter for our eyes? 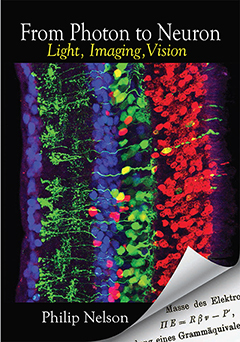 Old and New Results About Single-photon Sensitivity in Human Vision. Physical Biology 13 025001 (2016). Does a molecular motor pause to search for its next stepping spot? Tilting and Wobble of Myosin V by High-speed Single-molecule Polarized Fluorescence Microscopy. With Beausang, Schroder, and Goldman. Biophysical Journal 104 1263--1273 (2013). (featured in BJ's "Best of 2013"
How does a wave of cell division spread across an embryo? Wavefront Propagation and Mechanical Signaling in Early Drosophila Embryos . With Idema, Dubuis, Kang, Manning, Lubensky, and Liu. PLoS ONE 8 e77216 (2013). How much data compression is occurring in your retina? Retinal Adaptation to Spatial Correlations. With Simmons, Prentice, Tkacik, Homann, Yee, Palmer, and Balasubramanian. PLoS Computational Biology 9 e1003344 (2013). What is each retinal ganglion cell looking for? Neural Spikes, Identification from a Multielectrode Array. With Prentice, Homann, Simmons, Tkacik, Balasubramanian. Encyclopedia of Applied and Computational Mathematics, in press. How precisely can you pinpoint a rate change? Changepoint Analysis for Single-molecule Polarized Total Internal Reflection Fluorescence Microscopy Experiments. With Beausang and Goldman. Methods Enzymol. 487 431-463 (2011). . When we eavesdrop on a retina, who said what when? Fast, Scalable, Bayesian Spike Identification for Multi-electrode Arrays. With Prentice, Homann, Simmons, Tkacik, and Balasubramanian. PLoS ONE 6(7): e19884. How should you design the right DNA to make the best measurements of looping? Calibration of Tethered Particle Motion Experiments. With Han, Lui, Blumberg, Beausang, and Phillips. In Mathematics of DNA Structure, Function and Interactions, eds. C.J. Benham et al. (Springer, 2009). How can we monitor gene-regulatory events without any cells? Concentration and Length Dependence of DNA Looping. With Han, Garcia, Blumberg, Towles, Beausang, and Phillips. PLoS ONE, 4 e5621 (2009). Does myosin twist the `wrong' way around actin as it walks? Twirling of Actin by Myosins II and V Observed via Polarized TIRF in a Modified Gliding Assay. With Beausang, Schroeder, and Goldman. Biophys J. 95 5820 (2008). Is there spooky action at a distance in living cells? How does a regulatory protein manage to grab two distant places on a strand of DNA? First-principles Calculation of DNA Looping in Tethered Particle Experiments, final version, and its supplement. With Towles, Beausang, Garcia, and Phillips. Physical Biology, 6 025001 (2009).